The ISS has been around for 16 years now, and we're used to the idea of having a permanently-manned station in orbit. 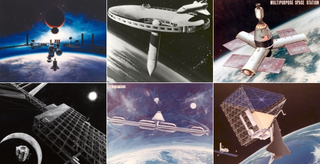 But in the decades leading up to its creation, NASA floated dozens of other ideas for a station—some of them prescient, others seemingly ridiculous to our eyes. These images have been around, in some cases, since the 1960s. But on Flickr, NASA has made it easier to see them all in one place thanks to its Space Station Concept album. Check out a few highlights below—imagine, the ISS could have been built inside the hollow shell of a used-up fuel tank. Here's a fascinating concept from 1977. Once the Space Shuttle had reached orbit, the main fuel tank—now empty—would "unwind" a solar array, with the station assembled next. The tank itself would become the hollow shell that holds the control center, "a space operations focal point for missions to the Moon and Mars," NASA explains. This 1960 concept was designed to be used with Apollo hardware—it would give astronauts a place to dock once in orbit and set up solar panels to power operations. In truth, the concept is not so very far off from the ISS. Inflatable habitats have been a constant dream for NASA—all the way back to 1961, when this prototype was actually fabricated by Goodyear Aircraft Corporation. The idea was to take the flattened module into orbit and then inflate it, creating a space for up to two astronauts. The "roof" was covered with solar array cells, that were to generate about 120 kilowatts of electricity. Within the V-shaped beams there would be five modules for living, laboratory space, and external areas for instruments and other facilities. SNAP-II was an experimental nuclear power supply that NASA developed to power its lunar probes in the 1960s. This concept for a space station would have attached one of the SNAP reactors to a long pole, intended to give the fragile humans inside the station a wide enough berth from the reactor. "The majority of early space station concepts created artificial gravity one way or another in order to simulate a more natural or familiar environment for the health of the astronauts," NASA explains. This concept for an artificial gravity station, from 1969, imagined it being assembled from old stages from the Apollo craft. The program was cancelled by Defense Secretary Melvin R. Laird in 1969 after the estimated cost of the program had risen in excess of $3 billion, and had already spent $1.3 billion. Some of the military astronauts selected for the program then transferred to NASA and became some of the first people to fly the Space Shuttle, including Richard Truly, who later became the NASA Administrator. The Solar Power Satellite was NASA's concept for farming energy in geosynchronous orbit, 36,000 miles above Earth. A 1976 drawing shows how NASA imagined using a huge lattice of solar panels to collect sunlight—then convert it into energy, to be transmitted to Earth via microwaves. The Space Station Freedom, shown here in Alan Chinchar's 1991 concept art, was an early version of what would become the ISS: Intended to be a permanently-manned orbiting station with a crew of four, it would be a cooperative project between the US, Canada, Japan, and a group of European countries.